My Budget Planner For Kids - Teach Your Child To Manage Money Wisely! My son is 9 years old and he is paying for his college education! As they get older, they spend more. Guess what happens when they are a teenager ... most parents eventually say, "When you get a job, you can spend your own money." Guess what happens when they get a job ... they spend it. Guess what happens when they get a pay rise ... they spend it. A year ago I read a story about the Rockefeller family. save 10% of their income. Interesting! You'd expect that these kids, raised in the lap of luxury, wouldn't need to learn these things. Yet Rockefeller wanted his kids to understand and value money. From the book by Robert Allen "Multiple Streams Of Income"
That story inspired me to teach my son about money. Our school systems do not provide any financial education to children. 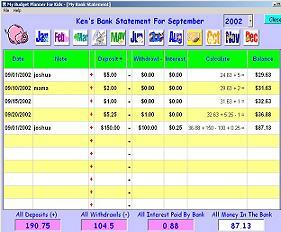 I decided to a build software that will help my son to learn about income, saving, spending, and giving. 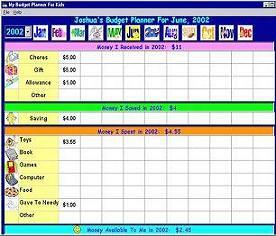 My Budget Planner For Teens (Ages 9 -16). 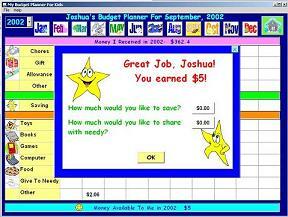 Joshua has a School Savings account with Washington Mutual where he deposits his savings. When there is money available for him to spend, he really enjoys buying toys and books. Today he is paying for his college education. On Joshua's birthday I gave him $50 to buy any toy he wanted. He pulled $20 and said: "This will go to my savings bank account." learn to give to the needy or charity. The software will ask your child to put some money into savings and some money into charity every time your child gets money. 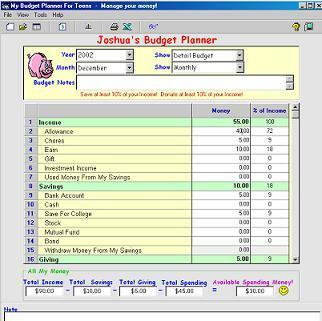 You can start using My Budget Planner For Kids or My Budget Planner For Teens right now by downloading it online, or by order a CD by mail. 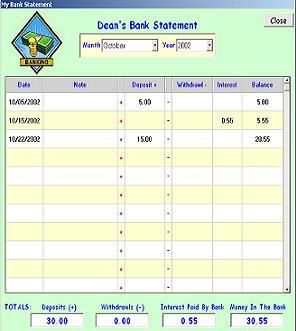 You can pay by credit card, check or money order. Start your child's financial education today!